The town of Kilmarnock has a rich and varied history. Many believe the town can trace its routes to St Marnock who founded a church in the area around the 7th Century. Whether that is true is open to debate. What is not, however, is the contribution the area has made to Scottish History. It is the Seat (Dean Castle) of the Boyd Family, the Home of the Wallace family the most famous of whom was Sir William Wallace who was born in Ellerslie near to Annanhill Golf Course. The first ever Publication of Robert Burns Poems was printed in Kilmarnock. The First Railway line in Scotland was built in Kilmarnock and was laid between the Town and Troon through what is now Caprington Golf Course. During the Industrial Revolution the Town expanded beyond all recognition and it would be fair to say probably became the most Industrial Town in Scotland if not Britain. World famous names in Industry took up residence in the Town over the next 150 to 200 years from 1800 to 2000. 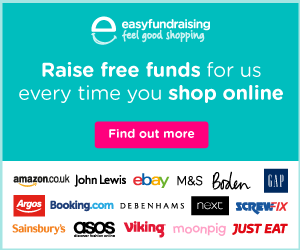 Names such as Saxone Shoes, Aird, Walker and Ralston, Glenfield and Kennedy, Glacier Metal, BMK carpets, Massey Fergusson and last and by no means least Johnnie Walkers Whisky. The Town was also a front runner in the Sporting field. Kilmarnock Football Club was founded in 1869 and is the oldest Professional Football Club in Scotland. Kilmarnock Rugby Club developed in 1868 and is strongly associated with the Football Club and its History and is the 3rd oldest in Scotland. 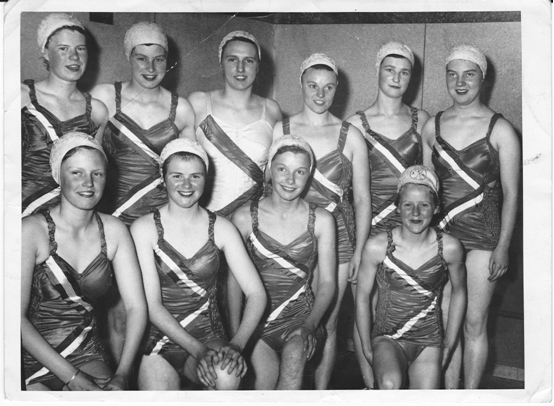 The Kilmarnock Amateur Swimming Club was founded as we have already learned in the 1920s although it can trace its routes back to 1902. In those days the Town had no swimming pool and used the local river which runs passed the Dean Castle as its Training venue. 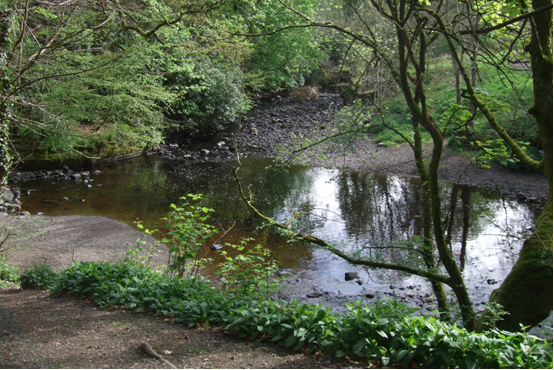 The meeting of the waters at the Dean Castle Estate, Kilmarnock. 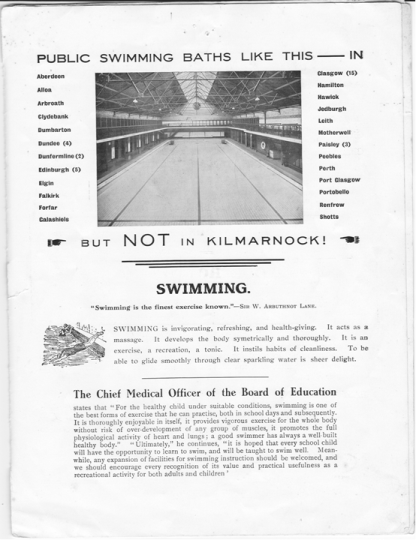 In the early 1900s the Towns Kilmarnock Academy Swimming Pool became available to the Club which was officially reformed in 1926. However by the late 30s the Town was crying out for a modern swimming pool, with a pool and hot baths available to the public, something that other Towns in Scotland had. The Brochure handed out during the campaign to have a pool built for the Town claimed that “Cleanliness was next to Godliness” and with an industrial town which had over 5000 homes without a bathing facility you can imagine the necessity of such an amenity. A suite of only 10 baths would allow over 75,000 people the opportunity to keep clean it claimed. Furthermore it also claimed that thousands of people drowned every year as they were unable to swim or were unable to provide any life saving methods for those who were unfortunate to find themselves in such a predicament. 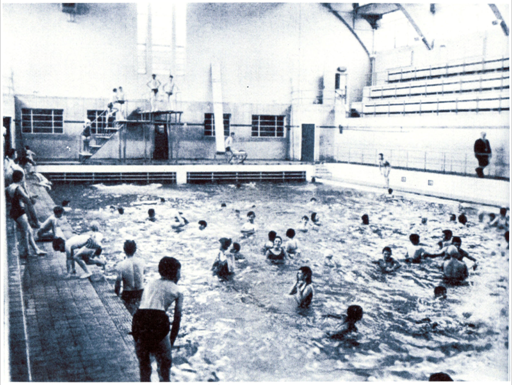 In Towns where Public Pools were present the Schools Authorities paid £100 to £150 per year to teach children to swim. Kilmarnock it claimed must take its share of this great work. 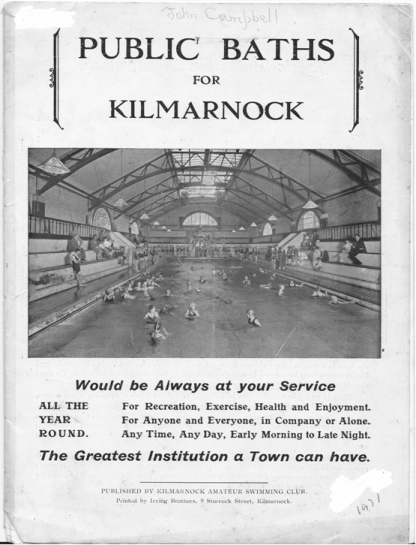 As a result of this campaign Kilmarnock was duly rewarded with a swimming pool which was officially opened in 1940 at a cost of £37,322.00. As a part of the opening ceremony Kilmarnock Amateur Swimming Club Floatation Design Team took centre stage. The Team consisted of Mrs Izatt, Miss Jean Miller, Miss Jean McPherson, Miss May Crosbie, Miss Betty Templeton and Miss Jean Gardiner. 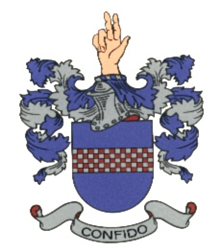 Mrs Izatt was the founder of the Design Team which eventually became Modern Synchronised Swimming. 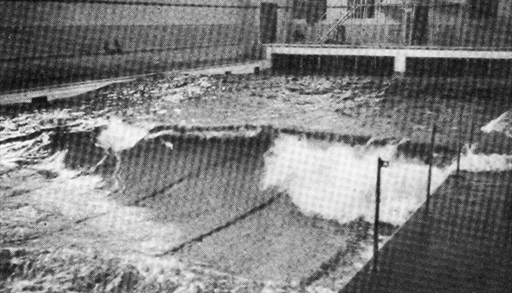 The pool also contained the only wave making plant in the World built and donated to the Town by Glenfield and Kennedy. During the 2nd World War (1939-45) the Pool was used by the Armed Forces not only from Britain but also from Canada and America prior to Operation Market Garden. Many armed personnel from all these countries were seen training not only inside the Pool as it could simulate the waves of the Ocean but also on the external façade of the building climbing and abseiling. Demonstrations were also given in the Pool by a Pilot and Commandos during the Wings for Victory Parade Week in Kilmarnock. Commandos threw a bridge across the pool and an American Pilot; Lieutenant John Horne donned his flying suit and American Mae west along with his parachute harness climbed onto the top diving board which was 30 feet above the water and, after being introduced to the crowd jumped off into the extremely choppy water. The announcer stated that the pilot would open his Carbon Dioxide bottle to inflate his Mae West which would sustain him until his dinghy was deployed. Things went from bad to worse as the Airman spent more time under the waves than above them. A member of the Pool staff was deployed to switch the waves off and in the ensuing silence the Airman eventually made his floundering way to the side of the pool where he was eventually rescued. A funny but true story but sadly for many of the men who trained and billeted in Kilmarnock prior to Operation Market garden few returned. A view of the pool taken from the upper balcony looking back towards the shallow end. A view of the pool looking towards the deep end during a wave session. The diving board seen in this picture is only one third of its original height. The top board reached the height of the ventilator box which can be seen to the left of the large window behind the boards. 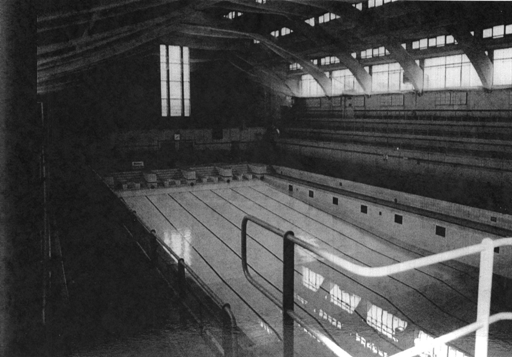 Through the intervening 40 years or so the Pool slowly fell into disrepair and despite all attempts to carry out cost effective repairs it was finally demolished in the 80s and replaced by the GALLEON CENTRE a purpose built facility for all sports. The new facility has a 25 meter pool but looks like a piece out of a jigsaw puzzle. Training in this pool is better as the swimmers can now train over a distance for which they are competing at, unlike the older swimmers who had to contend with a 33.3 yard pool (30 meters) x 14yards (11meters). They no longer have to swim through members of the public and can safely dive into a meter of water to swim lengths unlike the 9 inches of 40 – 60 years ago. Swimmers can now do circuit and weight training on sight instead of travelling to make shift facilities in Coaches garages or travelling to Schools (Onthank Primary School, Loudoun Academy e.g. ) as well as to Gorbals Baths, Jordanhill College, Wishaw Baths, Loudoun Academy and the Magnum Centre in Irvine, to get extra water time. Unlike the Town you have never had it so good.